Hello lovelies! I hope you're enjoying your week! It seems like summer is just around the corner here, I can't believe how fast spring has passed us by. I'm really enjoying the warmer weather and I've been trying to spend more times outdoors, especially with LO at the park. Have you been taking advantage of the lovely spring weather? I was in the mood for some iridescent glitter today and after digging in my stash, I found the perfect polish by Elevation called Azure Caverns. 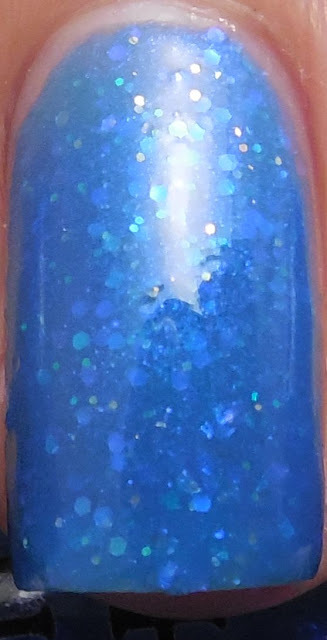 It's a bright blue jelly base with small iridescent hex glitters and shimmer. Two coats of perfection with one layer of topcoat. Bonus picture! I used My Ten Friends Dirtball as an accent nail and gradient on the tips. Dirtball is a charcoal jelly base with silver and teal green hex glitters. I love how Azure Caverns looks like Caribbean surf water, complete with bubbles. I wish I could find more colors exactly with this finish. Do you like my glitter gradient? I've been dabbling with gradients and trying to incorporate more accent nails and skittlettes into my routine. I'm not very good but I think practice will make perfect! Azure Caverns is super pretty! I also really like Dirtball and I want to get it eventually.